Holographic Passengers, Invisible Caravans, and Flying Cars. We have undoubtedly come a long way since the first gasoline powered car was unveiled back in 1885 by German inventor Karl Benz. Many would consider Benz the pioneer of modern day automobile transport, however that could soon change. Let us shift our focus instead to Robert Anderson, a Scottish inventor who invented the first ever electric carriage as far back as 1832–1839, or the American inventor Thomas Davenport who created his own electric car in 1835. Electric cars were in their heyday until 1908, when Henry Ford (the founder of the Ford Motor Company) released his gasoline fuelled Model T. After that, the electric car industry would decline until almost a century later. Fast forward to 2019, and everything has changed; namely the climate, allegedly. Climate change has been a very controversial topic over the last decade inspiring many heated debates amongst scholars. As regulations and quotas have been introduced targeting manufacturers and corporations on reducing their carbon footprint and vehicle emissions, the industry has responded by reigniting it’s interest in electric vehicles (EV’s). The consumer reaction to electric vehicles had been underwhelming for a long time, primarily due to the lack of infrastructure to support the recharging of electric vehicle batteries, and also the journey length restrictions imposed by the battery life available. This was partially addressed with the introduction of hybrid vehicles that combined electricity and an internal combustion engine allowing drivers to reduce their carbon footprint with little inconvenience. Recently Volkswagen have announced they are ready to launch mobile charging stations for electric vehicles, independent from a power source that can be moved from location to location. Each station will be capable of charging a car to 80% capacity in roughly 15 minutes, and can charge up to four cars at any given time. In the last few years, Plug-in Electric Vehicles (or PEV’s for short) are becoming more and more attractive to drivers. Electric vehicles are typically cheaper to run, have lower maintenance costs, generate less pollution and have even enjoyed road tax subsidies as the Government continue to encourage drivers to transition from petrol to electric. In Norway the consumer uptake of electric vehicles has been overwhelming thanks to tax exemptions and free parking. According to official figures from Norway’s Information Council for Road Traffic, 29% of all new vehicle sales were hybrids, with a further 31.2% being zero emission electric vehicles. This accounts for over 60% of all new vehicle sales in Norway last year. As vehicles evolve in the technological age, we see more and more modern conveniences crammed into the dashboard and seating. This used to be small things like old removable stereos, electric windows and those pop out lighters. Nowadays in car technology has grown into something much more impressive; we’re not just talking heated seats, built-in satellite navigation or TV’s built into the headrests either. In addition to already unveiled concepts, Las Vegas hosted the Consumer Electronics Show of 2019 last week, and some of the technology displayed was quite astounding. 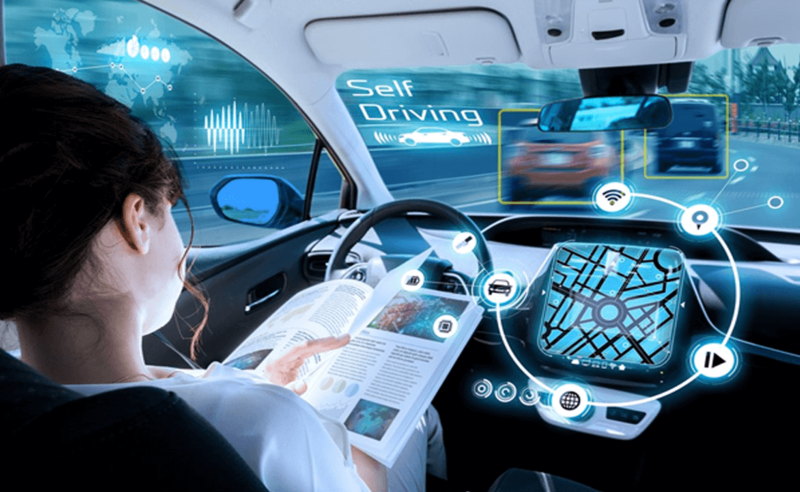 Nissan recently announced it’s I2V (or “Invisible-2-Visible”) technology that connects to the company’s “Metaverse” (a virtual world for autonomous cars). The technology would project a 3D-visualisation of the surrounding area onto the drivers dashboard allowing them to see around corners, or even project a 3D holographic person into the passenger seat to keep you company on lonely journeys. Chinese automaker Byton showcased it’s 48-inch “Shared Experience Display” (SED), a large electronic screen that reaches across the entire breadth of the dashboard. Coupled with an 8-inch touchscreen between the front seats, a 7-inch touchscreen built into the steering wheel and a further two screens built into the headrests, Byton really are turning their cars into moving cinemas. BMW revealed it’s new Vision iNEXT and it’s aptly named “ShyTech”. ShyTech refers to the implementation of “practically invisible – buy always available” features that are built into unexpected surfaces including wood and fabric, that can be voice controlled. The digital technologies only appear when summoned by the occupant. Valeo have announced the “XtraVue Trailer” system which can be used to make a towed caravan or trailer appear invisible, allowing a driver full visibility of the road behind them. Several cameras are mounted on the outside of the caravan or trailer, with all the separate feeds combined into a singular display. In addition to the “XtraVue Trailer” system, Valeo also announced a joint project with CREE (an LED manufacturer). Named “PictureBeam Monolithic” the Valeo system will project up to 1.3 million pixels from the headlights to illustrate guidance and relevant information on the road surface. All in all, most of the technological offerings being revealed lately aren’t exactly game changing. There are some nice helpful features, some novelties that don’t really offer much in terms of true value, and a lot of additional functionality that will gradually be implemented as standard features. So where is the big innovation? What is the next major overhaul in the motoring industry? Well… for a start, it involves propellers. That’s right, what once sounded like an outlandish and wacky futuristic pipe dream is seemingly becoming a reality. New Future Transportation Inc. (NFT) are developing an electric Vertical Takeoff and Landing (eVTOL) vehicle after revealing prototypes to investors and partners. Toyota are backing the SkyDrive, developed by Japanese volunteer organisation Cartivator. The engineers at Cartivator are hopeful they can release a working version of the drone inspired vehicle in time for the 2020 Tokyo Olympics. Uber have been also toying with the idea of a flying car in the form of it’s “Uber Elevate“. Chinese motoring manufacture Terrafugia have already began taking orders for their “Transition“, a light-sport craft that can fold out wings and take to the skies in less than a minute. Ehang, another Chinese company revealed it’s “184” concept back in 2016, but now it has completed extensive testing including over a thousand test flights, and seems almost ready for a commercial launch. Airbus have been working in conjuction with Audi and Italdesign on their own “flying taxis” dubbed the “pop.up“. Our favourite manufacturer to throw their hat in the ring is the very James Bond-esque offering from none other than Aston Martin. The “Volante Vision” will be another example of VTOL technology, with three seats and an optimistic release date of 2020. Huge strides in technology continue to bleed into other industry sectors and revolutionise our lives in ways we could never imagine. As the years go by, we continue to be blown away by what innovators and visionaries develop. Back in 1885, when Karl Benz designed the first gasoline powered car he was revered as a pioneer; and now we are talking about automated, vertical take-off, flying vehicles with invisible screens that appear when you tell them to.